Candee, Debbie, and I traveled through the state of West Virginia not too long ago, and the scenery and camaraderie were great, but even more memorable were some of the foods that we tried, in fact, almost everything we tasted was out of this world! Whenever possible, we try to ask local people for their personal favorites–as it sure beats paging through a telephone book. I don’t know about you, but I think that chain restaurants get pretty boring after awhile! My travel rule: always try new things whenever possible. After a long day of driving, we stopped in Fayetteville, West Virginia (right near the New River Gorge Bridge) for the night. After getting our room key, we asked the lady behind the counter about places we could go for dinner. Without hesitation she answered, “Pies & Pints,” and I must admit that I first thought that she must have been on some kind of compensation plan because she answered so quickly, but I pushed that thought aside and followed her advice and inwardly wondered what could possibly be so fantastic about pizza. This is how I describe them.…Wow! Although they bill themselves as a pizza joint, they are that and so much more. The atmosphere can best be described as casual-friendly and they offer indoor seating as well as an open-air area that overlooks a playset for children. We opted to sit outside. Pies & Pints offers starters, sandwiches, salads, pizza (of course), and several delicious sounding dessert options. The beverage choices include: draught beer, a huge variety of premium bottle beer, wine, an assortment of fountain drinks, tea, and coffee. Now to the best part….the PIZZA! I have never seen such a wide assortment of pizza in my life. It took us a long time to look at the menu because of all of the unique choices. 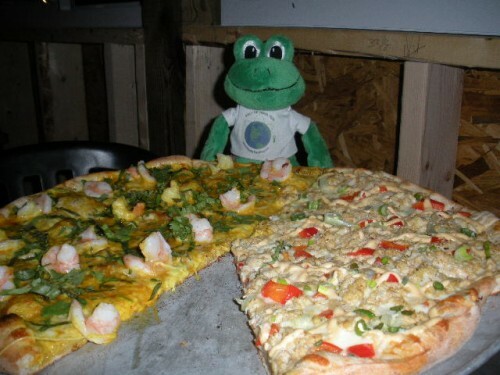 We had a really hard time deciding and finally had narrowed it down to two choices: Thai Pie and the special of the day, Maryland Crab. Our waiter quickly solved our dilemma by suggesting that we order a half & half pizza. Perfect! That was easy! The rest as they say is history…our meal was delicious and we’ll definitely come back to Pies & Pints if we find ourselves in the Fayetteville, WV area again. But wait…I just remembered that they’re opening a new restaurant in Charleston this Fall. (2010) Yeah, more pizza! They don’t offer fly pizza! I knew from the title this would be about Pies and Pints! 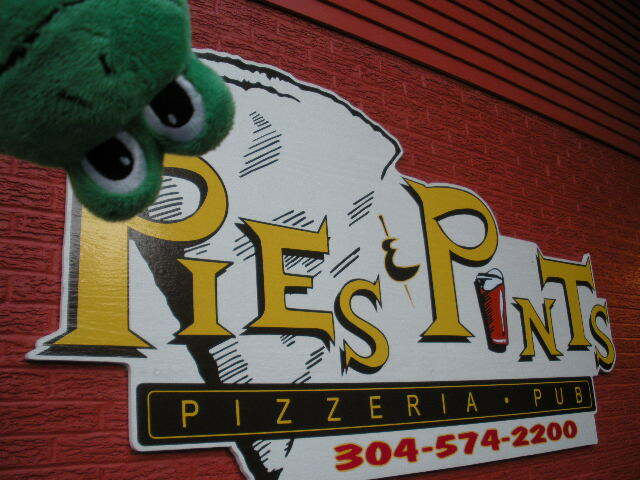 Oh…I miss Pies and Pints! What?! No fly pizza? That’s barbaric! I’ll take it up with the management! I’ll write a letter to my senator!!! I’ll…I’ll…hold on a sec… Did you say Maryland crab? Ummm…never mind. I’m happy! Yum! The Thai Pie looks so good!